mangleverb, Other effects bundle or multi-effect from Audio Damage. Audio Damage announces the release of Mangleverb, a new plug-in that combines a reverb to a filter, an envelope follower, an LFO and a VCA. Available on both Mac and PC, Mangleverb is an effect Swiss knife that can be used as a filter, a reverb, or a transient shaper, a rhythmic gate, a VCA and more. 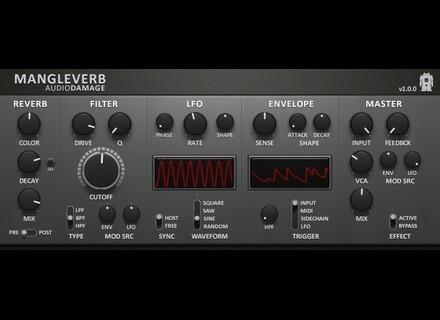 The algorithmic reverb is an improved version of the Audio Damage Deverb, and it can be placed pre or post-filter/VCA. The resonant filter offers three high-pass, band-pass and low-pass modes, and a Drive circuit allows for adding distortion. Last, the envelope follower features Internal, LFO, sidechain input and MIDI trigger modes. Mangleverb is an AU and VST plug-in for Mac OS X and Windows, it is available at www.audiodamage.com for $49. Friday's Freeware: NeuronVS and a Mildon Bundle We chose three free plug-ins for you this week: the Hartmann Neuron synth reproduction for Mac and a processing bundle by Mildon Studios for PC.